I wish them all well for wherever their dancing takes them and look forward to seeing them before they leave in Dubboo, opening shortly in Sydney. And of course there is the thrill of seeing new dancers in 2019. My chapter, ‘Elektra. Helpmann uninhibited’ considers the origins of Helpmann’s ballet Elektra, Helpmann’s choreographic approach, and the differences, particularly in relation to Arthur Boyd’s designs, between the English production of Elektra in 1963 and that presented by the Australian Ballet at the Adelaide Festival in 1966. Edited by Richard Cave and Anna Meadmore. 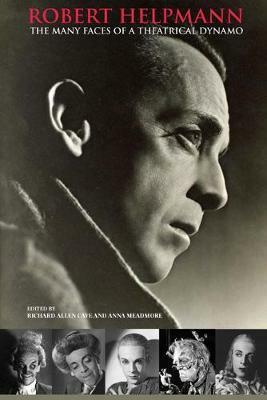 Published in the United Kingdom by Dance Books in October 2018. Available from Dance Books Ltd and other retailers. 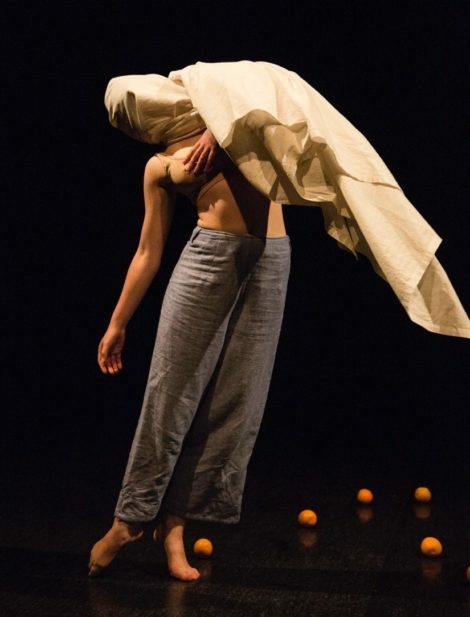 Liz Lea: For the multi-media production RED, which drew together the work of four choreographers, including Lea, in a moving, courageous and dramatically coherent exploration of the medical condition of endometriosis. My review of RED is at this link. Alison Plevey and the Australian Dance Party: For Seamless, an innovative, well-considered and theatrically staged comment on the fashion industry, performed with wit and skill at the 2017 Floriade Fringe. My review of Seamless is at this link. Emma Nikolic and Karen Brock: For their innovative choreography for the Canberra Philharmonic Society’s production of Strictly Ballroom. 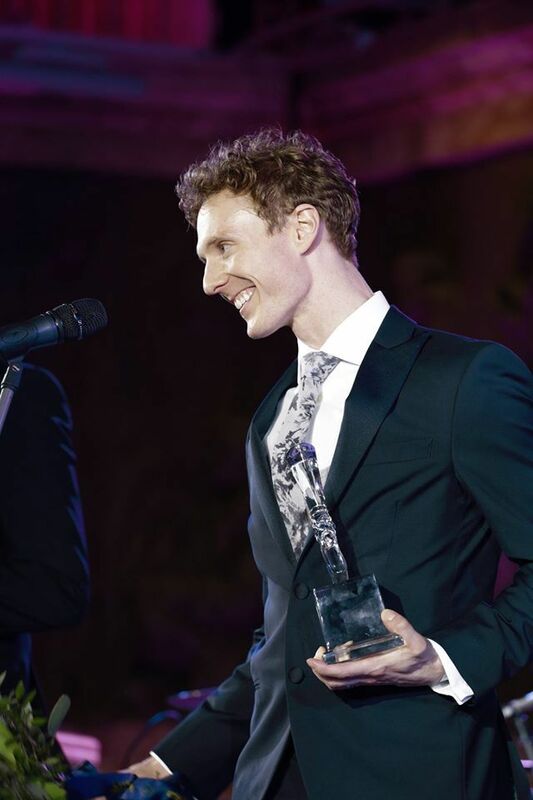 Their inventive interpretations of a number of traditional ballroom dance styles allowed the large ensemble of dancers to convince as champion ballroom dance contestants. Michelle Heine: For her choreography for Free Rain Theatre Company’s production of 42nd Street. Her choreography for the spectacular production numbers successfully captured the authentic Broadway feel of the musical and was exceptionally well danced by the ensemble. Canberra dance goers will be interested to learn that James Batchelor will be back working in Canberra in 2019. He will be showing his latest work, Hyperspace, at a time and a Canberra venue to be announced. Hyperspace was made in 2018 during residencies in Nottingham, England, and Bassano del Grappa, Italy, and was recently performed in the B.motion festival in Bassano and at La Briqueterie Paris. It will also be part of the Dance Massive 2019 line up in Melbourne. Batchelor is also looking forward to creating a new full-length work for Quantum Leap. It will premiere as QL2’s major work for the full ensemble at the Playhouse in August. 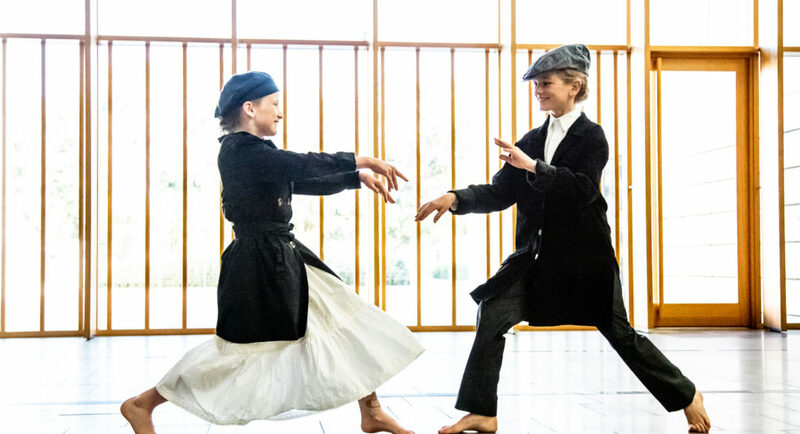 The National Gallery of Australia has just installed a new children’s play area that highlights aspects of the Gallery’s extensive collection of costumes from the era of the Ballet Russes. 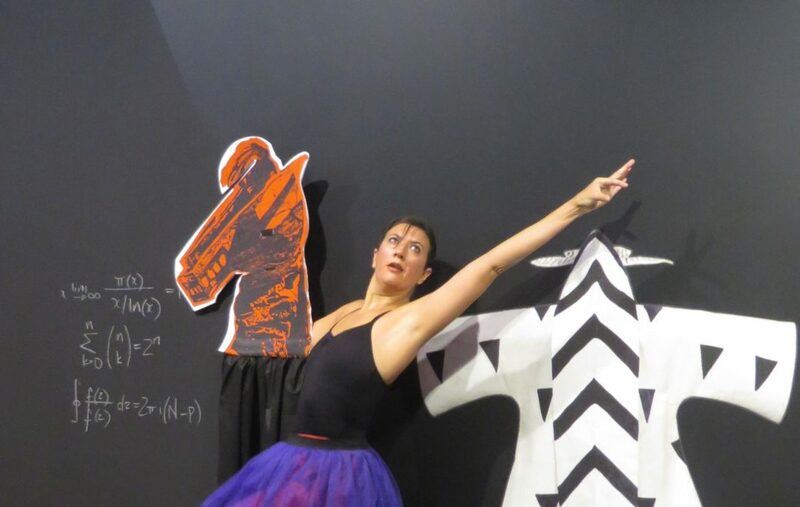 It is designed by Melbourne-based artist Sally Smart, one of whose interests is in the juxtaposition of the art of the Ballets Russes with contemporary ideas of assemblage, cut-out items and patchwork-style lengths of fabric. Dance features in a series of projections of dancer Brooke Stamp improvising in homage to and inspired by the dances of the Ballets Russes era (with a nod to Javanese dance). Stamp performed live (a one-off performance) at the opening of the play area early in November. ’Rudolf Nureyev.’ Program article for La Scala Ballet’s Australian season, 2018. This article contains two very interesting, casual photos of Nureyev (one with Fonteyn), which I have not come across before. 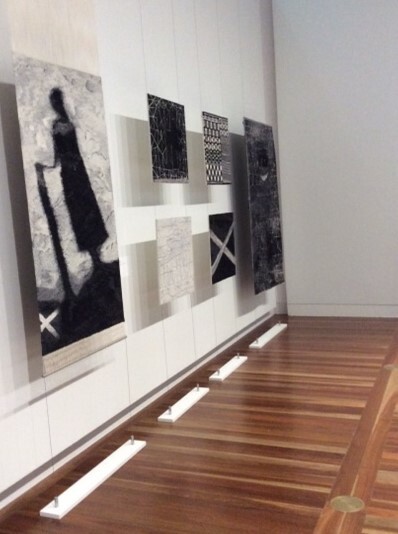 The National Portrait Gallery in Canberra has once again supported dance as an adjunct to its exhibition program. 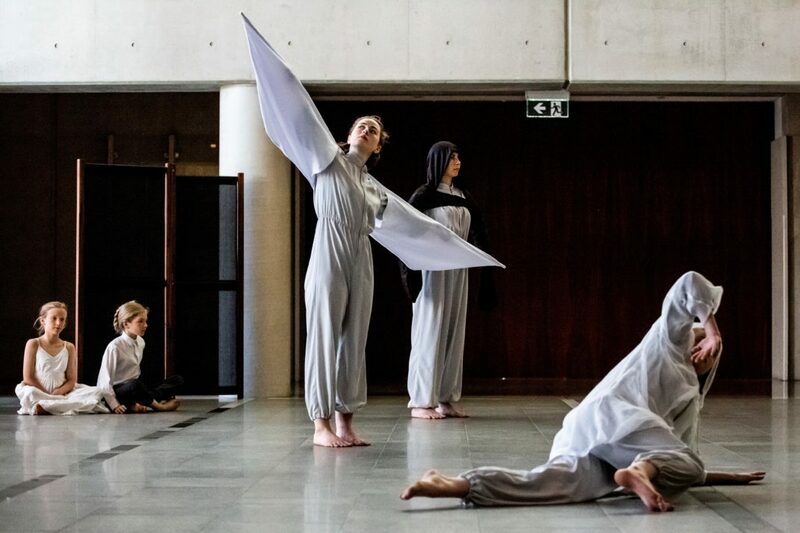 In conjunction with So Fine, an exhibition celebrating work made by contemporary women artists, Ruth Osborne has created four short dance pieces under the umbrella title Strong and Brave. The four works reflect selected works from So Fine and use dancers from QL2 Dance—Oongah Slater, Alana Stenning, Serene Lorimer, Akira Byrne and David Windeyer. It perhaps helps to see the exhibition before watching the dance. My observations about the relationships between the art and the dance may not coincide with those of others. The opening item was, I decided, a reflection on the art of Valerie Kirk who expressed, in captions accompanying the exhibition, her interest in ‘textile tradition and culture’. 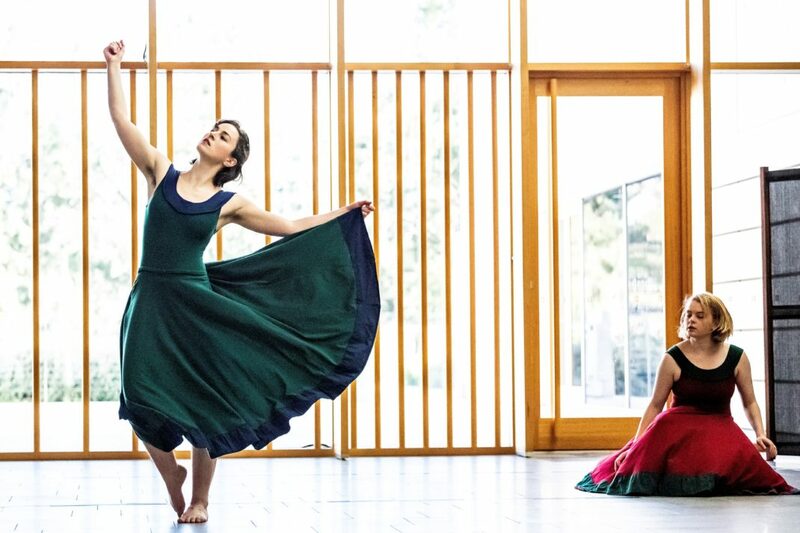 It was a lovely bit of choreography for three women who often worked together but often also separated from each other and became absorbed in the full skirts of the costume they were wearing. It was eminently watchable dancing, and in the end it didn’t matter so much about the reference. 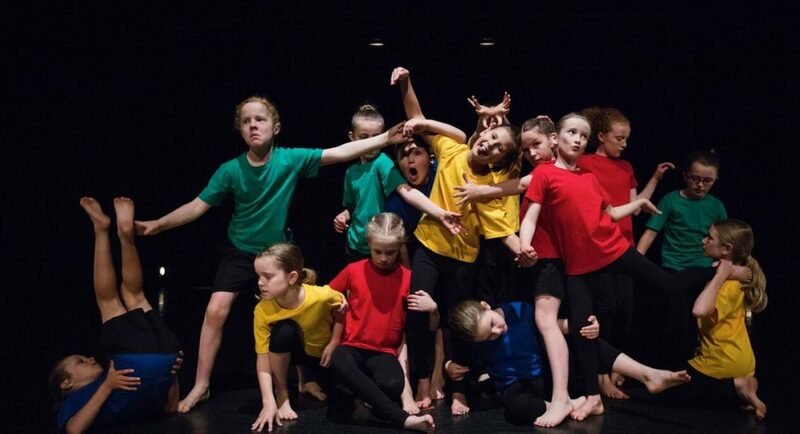 The most moving dance item for me was the second piece, which clearly related to images by Fiona McMonagle referencing Britain’s child migration scheme by which thousands of children were sent to Australia for ‘a better life’. Two young dancers interacted with pleasure and excitement, two grown ups offered comfort on the one hand, but demanded conformity and obedience on the other. Bouquets in particular to the two young dancers who met, interacted and stood together through it all. The third work on the program was also moving, although in a somewhat different way. It was largely a solo and seemed quite introspective. It appeared to reflect the art work of Leah King-Smith whose portraits of her Aboriginal mother are presented in the exhibition as layered works using photographs taken by her father, The original photographs have been subjected to a range of contemporary techniques and the finished works have achieved a softly distorted appearance. King-Smith calls her work ‘photography dreaming’. Osborne has used a piece of white, gauzy material to achieve a similar look and the work is dreamlike and emotionally affecting. The final work was the least successful, largely because it lacked the subtlety of the previous three works. 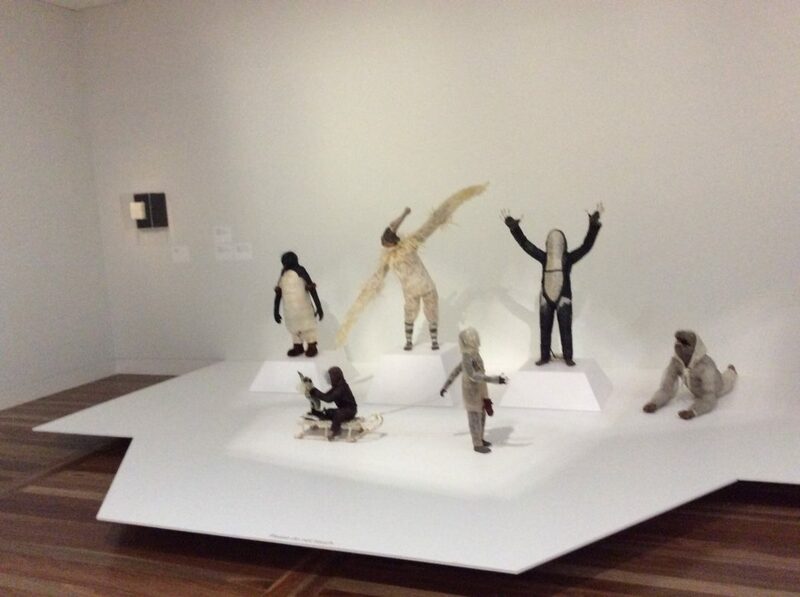 It reflected the art work of Linde Ivimey who accompanied a friend on a voyage to the Antarctic and made a series of small sculptures based on that journey. 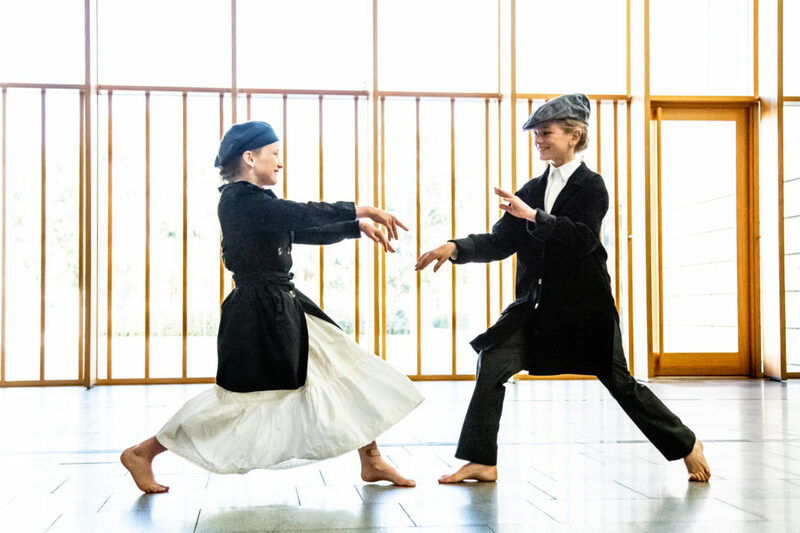 It is a privilege to have seen several of the collaborations that have developed between the National Portrait Gallery and Canberra’s dance organisations. The Gallery now has a new director and will also be closing for several months in 2019 for renovations to the building. 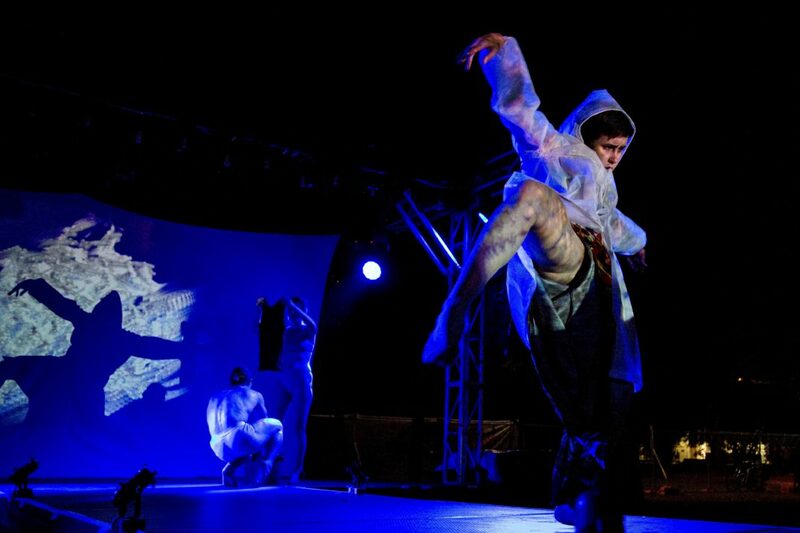 I hope in these renewed circumstances dance/art collaborations will continue. It gives us an opportunity to ponder about art in both its visual and performing genres. That can only be a good thing. For reasons that escape me, my Canberra Times review of Quantum Leap’s Two Zero, filed first thing Friday morning (the morning after! ), has not yet appeared online, as is the usual practice. The review may appear in the print edition of The Canberra Times on Monday 13 August. In the meantime, here is an expanded version of that review. 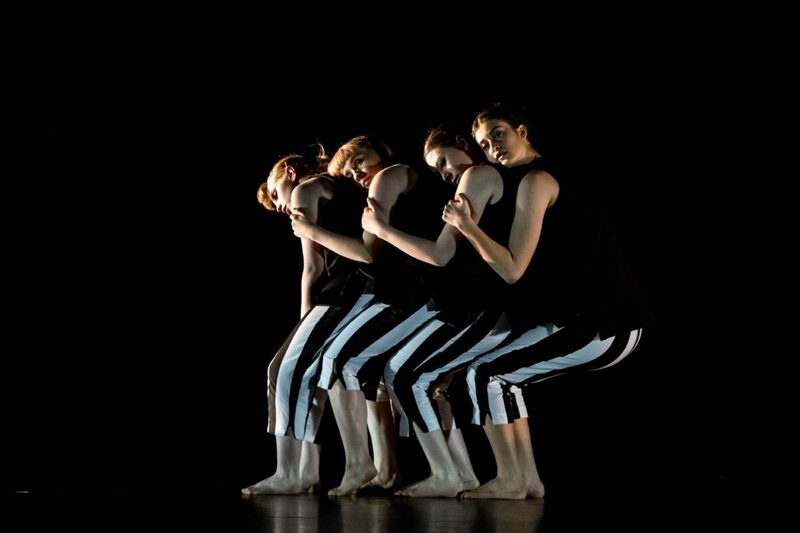 Two Zero celebrates twenty years of dance by Quantum Leap, Canberra’s youth dance ensemble and the performing arm of QL2 Dance. The program was set up as a continuous performance in eight sections, three of which were restagings of works from previous seasons with the other five being works newly created for this particular occasion. In the terms of choreography, the standout work was Daniel Riley’s Where we gather. It was first seen in 2013 as part of Hit the Floor Together and was remounted for this 2018 season by Dean Cross with final rehearsals overseen by Riley. Where we gather explored the idea of young people from Indigenous and non-Indigenous backgrounds working together. It showed Riley’s exceptional use of organic and rhythmic movement patterns, and his remarkable feel for shape, line, and the space of the stage. It had been so well rehearsed and was so beautifully danced that it was hard to accept that the dancers were part of a youth ensemble. 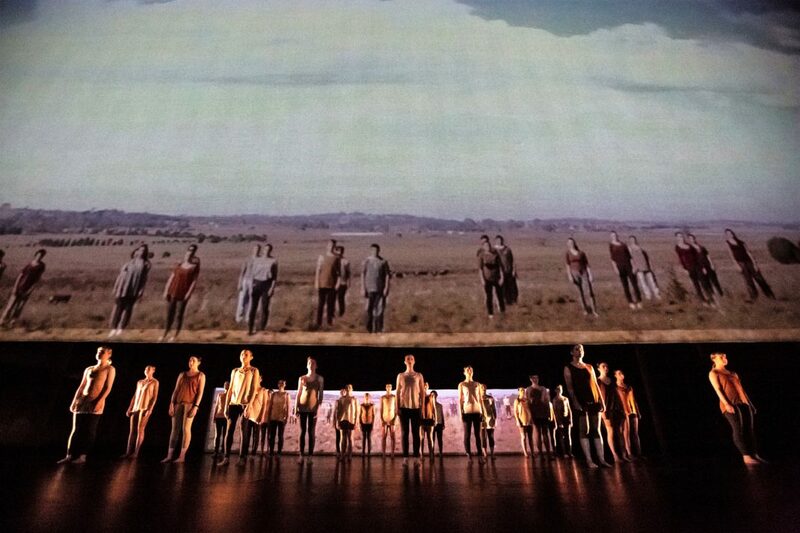 The film that preceded it (also from 2013) was a fascinating piece of footage showing, with close-ups and long shots, dancers performing outdoors in a landscape that epitomises the ‘wide brown land’ of Australia. 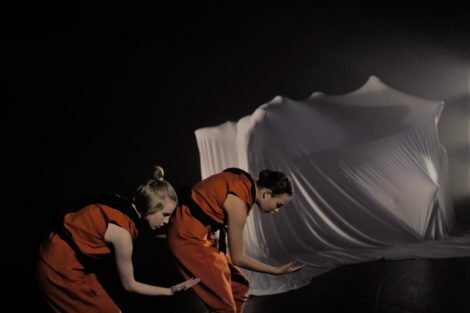 The seamless transition from film to live performance was engaging to say the least as a scrim that had been the screen slowly lifted to reveal the dancers onstage in more or less the same position as the final screen image. And the dancing began. Where we gather with its accompanying film opened the show and set the scene for an evening of which QL2 Dance can only be extraordinarily proud. Jodie Farrugia’s This land is calling from the project Identify of 2011 was remounted for this season by Alison Plevey and was perhaps the most moving work on the program. 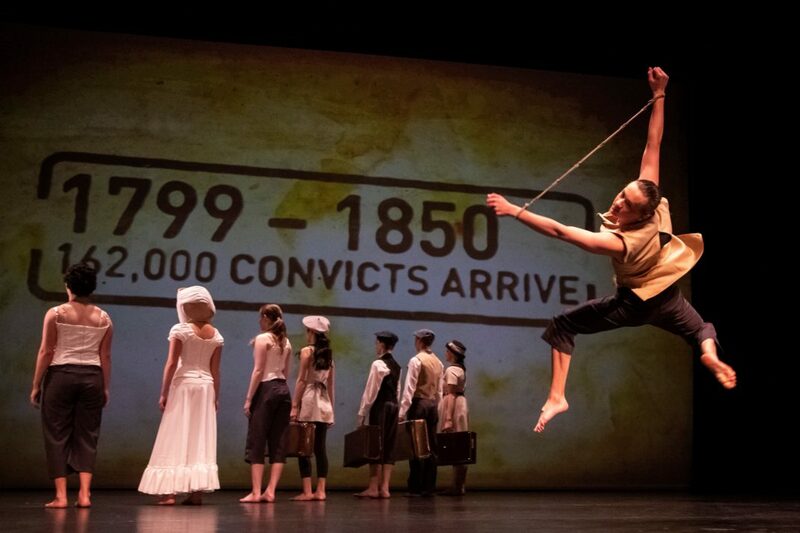 Its focus on aspects of migration to Australia from the arrival of convicts to the present waves of refugee migration was powerfully yet simply presented. Suitcases were used as props by some, others had nothing, a convict was chained round the wrists. Groupings were sometimes confronting, sometimes comforting. 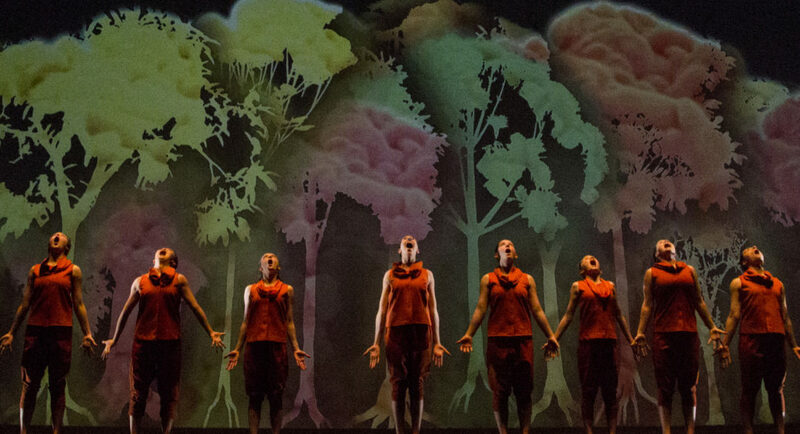 It was a thoughtful and forceful piece of choreography enhanced by lighting and projections that opened our eyes to the extent and diversity of migration to this country. I was intrigued by Eliza Sanders’ section called Bigger. It was a new work for ten female dancers, which examined the impact of shared female experiences and their outcomes. Sanders choreographs in a way that seems quite different from her colleagues. Her movement style is mostly without the extreme physicality of other Quantum Leap alumni and yet is fascinating in its fluidity and emphasis on varied groupings of dancers. I was not all that impressed, however, with its opening where all ten dancers were huddled (or muddled) together each holding some kind of reflecting object. It turned out to be a sort of perspex magnifying glass that indicated (we slowly discovered) the growth of experience. I could have done with less emphasis on the magnifications. The moments without them were full of joyous movement. Other works were by Sara Black, Fiona Malone, Steve Gow and Ruth Osborne. All added an individualistic perspective to the evening. One aspect of the show bothered me. Black and white striped, calf-length pants were a feature of the costume design for several sections and were worn under differently coloured T-shirts. They worked in some but not all sections. In Ruth Osborne’s Me/Us, a new work in which the dancers spoke of their thoughts about themselves and where they saw their place in society, they were at their best. Similarly they worked well in Steve Gow’s strongly choreographed Empower. But I thought they looked ugly underneath the white floating garments used in Bigger. Nevertheless, Two Zero was a thrill to watch and its finale Celebrate! showed us a mini retrospective of what had happened before. The achievements of Quantum Leap, its collaborators across art forms, and the remarkable list of alumni who have emerged from it over twenty years, are spectacular. May the work continue for at least another twenty years. Two Zero: Choreography: Sara Black, Dean Cross, Jodie Farrugia, Steve Gow, Fiona Malone, Ruth Osborne, Alison Plevey, Daniel Riley, Eliza Sanders. Music: Adam Ventoura, Warwick Lynch. Film: Wildbear Entertainment. Lighting: Mark Dyson. Costumes: Cate Clelland. UPDATE (13/08/2018): see the shorter review online in The Canberra Times at this link. 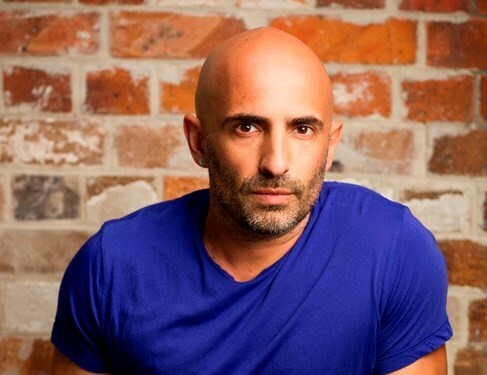 It has just been announced that Canberra’s youth dance organisation QL2 Dance has a new patron, Sydney Dance Company’s artistic director Rafael Bonachela. He joins Shirley McKechnie, AO, as co-patron following the retirement of Sir William Deane, AC, KBE, QC and Lady Deane who had been much respected patrons for fourteen years. It is an honour and a privilege to be the QL2 Dance Patron for 2018. QL2 Dance truly sets the example for quality dance in Canberra and nationwide. Over my choreographic career I have worked with many artists that have passed through their doors and commend them all on their professionalism, technique and creativity. 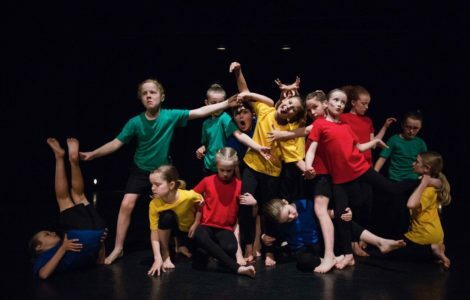 The training and performance platform that QL2 offer to youth dancers and emerging artists in Australia is of the highest standard; an invaluable asset to the local community. I look forward to joining and supporting QL2 on their journey into the future. Quantum Leap, the QL2 performing arm, will celebrate its twentieth anniversary from 9–11 August at the Canberra Theatre Centre with a production called Two Zero. 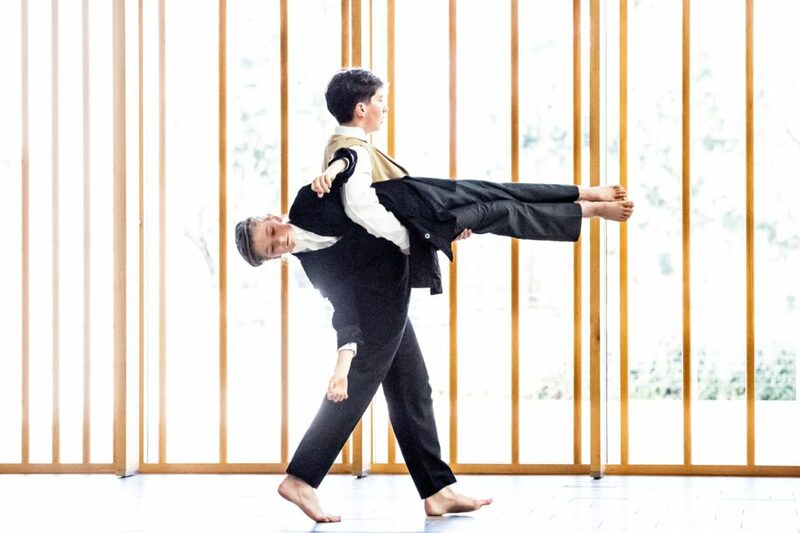 Choreography will be by Eliza Sanders, Stephen Gow, Sara Black, Ruth Osborne, Alison Plevey, Dean Cross and Daniel Riley, with the Quantum Leap Ensemble. I was sorry to hear of the death of Gillian Lynne early in July, although I had heard when last in London that she was not at all well. In my April Dance Diary I recalled briefly her work for Robert Helpmann in Australia and more recently for Birmingham Royal Ballet, and also commented on how much I enjoyed reading her autobiography A dancer in wartime. Here is a link to an obituary published in London by The Guardian. Some time ago now (in 2011 to be exact) when I was working on an article for Dance Research about the Dandré-Levitoff tours, I posted an article on Alexander Levitoff. Very recently a comment on that article was made and in it was included an extremely interesting catalogue of photographs, including some of Levitoff. But there are many others that I have not seen elsewhere. Here is the link to the 2011 post. Scroll down for the comments and the link. 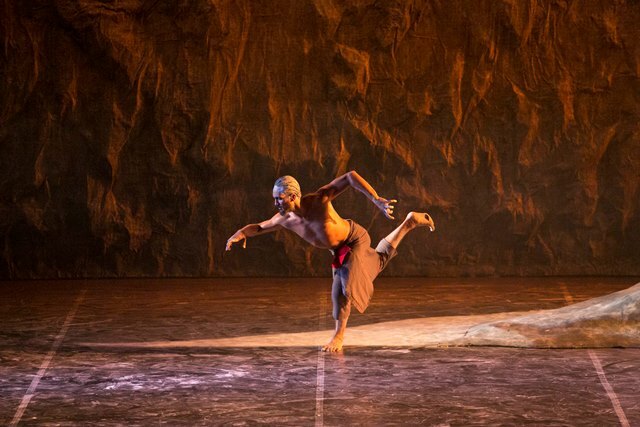 ‘Dark Emu lacking in structure.’ Review of Bangarra Dance Theatre’s Dark Emu. The Canberra Times, 30 July 2018, p. 20. Online version at this link. This year the three choreographers working on the show, Alison Plevey, Steve Gow and Jack Riley, made sure that in each section the theme was very clear. The younger group had a strong section, Square Peg, in which there was an exploration of how they saw themselves. 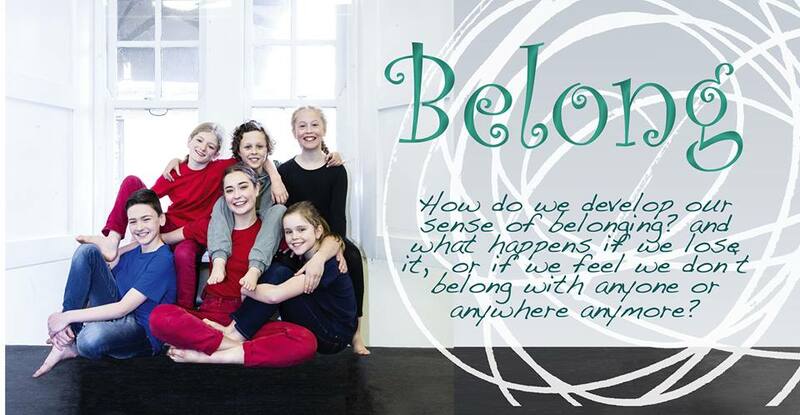 ‘I was born in Canberra’ said one young dancer, and all those who identified in this way grouped themselves with her. Another dancer said ‘I can whistle through my teeth’ and the same thing happened, with appropriate accompaniment. And so on. It was a simple, but effective exploration of the theme, and was the work of Plevey. I especially enjoyed the section by Steve Gow for an older group of dancers. Called ‘Virtual Identity’, it looked at social media as a way of conforming to expected notions about who we are: ‘Get the perfect picture’, ‘Write the perfect post’ and so on. Visually and choreographically Gow made an arresting statement about conformity and I admired the use of masks to get across the idea of conformity and the lighting (Kelly McGannon) of this section. Gow’s use of groups of dancers in constantly changing arrangements made this section simple but powerful. Probably the most sophisticated section was Jack Riley’s ‘Allone’. It explored the idea of the power one person can have in society. 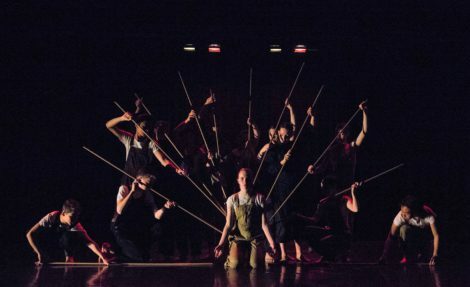 Riley used probably the most senior of the dancers to examine this idea and made use of long wooden sticks as props to symbolise the roles one might have in society. I have admired Riley’s shorter works on previous occasions. In these situations, he has the ability to structure a work carefully and intelligently, and to use his widely varied movement experience to get his ideas across. ‘Allone’ was admirable and I suspect its relative brevity was to Riley’s benefit. As ever, the closing sections of the QL2 show were expertly choreographed as a continuous part of the show. But the highlight of Not like the others was the strength of its message. Having a good idea for a show is one thing. But being able to put it across to an audience with the power that Plevey, her collaborators, and a bunch of young dancers did deserves much respect. 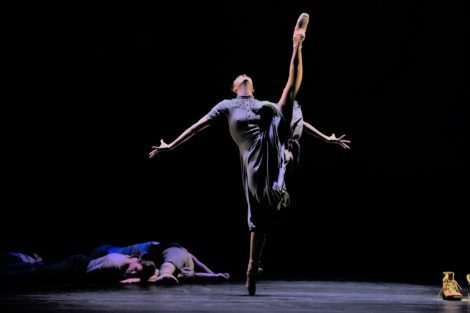 Details of the Australian Ballet’s 2018 season were revealed in September and this year Canberra audiences can anticipate a program from the national company. The Merry Widow, which David McAllister has called ‘a fantastically well-constructed soufflé’, was created for the Australian Ballet in 1975 as the first full-length production commissioned by the company. It will open at the Canberra Theatre Centre on 25 May and run until 30 May. Based on the operetta of the same name, it has choreography by Ronald Hynd, a scenario by Robert Helpmann (in 1975 artistic director of the Australian Ballet), and music by Franz Lehar. It will also have seasons in Sydney and Melbourne. But beyond soufflés, and for those who like their ballet to have more intellectual input, an interesting program is scheduled for Melbourne and Sydney. Called Murphy, it honours the contribution Graeme Murphy has made to the Australian Ballet, which he joined from the Australian Ballet School in 1968. Programming is not yet complete, apparently, but we know that the main item on the program will be the return of Murphy’s Firebird, which he created for the Australian Ballet in 2009. I want to give the audience the magic that they believe Firebird is. It will be a rich and opulent experience for them. Besides, the score is completely dictative of the narrative, which makes it hard to stray from the story. Firebird is imbued with Diaghilev’s thumbprint. I am keeping all the elements of the work, the symbols of good and evil for example, but I will be focusing in a slightly different way. It will be a little like the world of winter opening up to let in the spring. As for the rest of the season: Maina Gielgud’s production of Giselle will return for a season in Melbourne, while Sydney will have a return season of Alexei Ratmansky’s wonderful Cinderella; there is a new production of Spartacus in the pipeline, which will be seen in Melbourne and Sydney; Melbourne will have an exclusive season of a triple bill called Verve with works by Stephen Baynes, Tim Harbour and Alice Topp; and Adelaide will see The Sleeping Beauty. For dates and further information see the Australian Ballet’s website at this link. 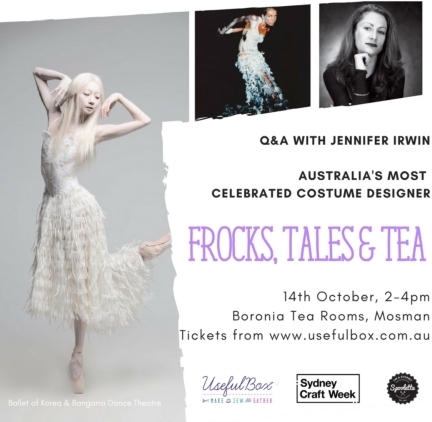 Jennifer Irwin, costume designer par excellence and recipient of the 2017 Australian Dance Award for Services to Dance, will be the special guest at an event hosted by ‘UsefulBox’ on 14 October at the Boronia tea rooms in the Sydney suburb of Mosman. Irwin will talk about her creative process and what inspired her as an artist. Further information at this link. The death has occurred, unexpectedly in France, of Andrée Grau, well-known dance anthropologist, and long-standing staff member of the University of Roehampton. Grau’s achievements, which include work in Australia, appear on the Roehampton website at this link. ‘Great flair shown in austere setting.’ Review of Circa’s Landscape with monsters. The Canberra Times, 8 September 2017, p. 31. Online version. ‘Untangling the truth.’ Preview of Gudirr, Gudirr, Dalisa Pigram and Marrugeku. The Canberra Times, 16 September 2017, Panorama p. 16. Online version. Featured image: Amy Harris and Adam Bull in The Merry Widow. The Australian Ballet 2018 season. Photo: © Justin Ridler. This Poisoned Sea, Quantum Leap’s major show for 2017, took as ‘a launchpad’ (as the media says) Samuel Taylor Coleridge’s epic poem The Rime of the Ancient Mariner. 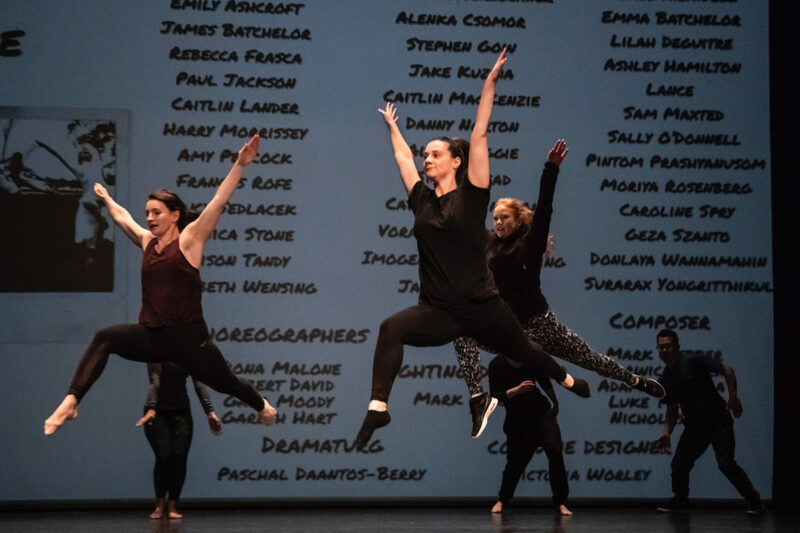 Three choreographers, Claudia Alessi, Eliza Sanders and Jack Ziesing, presented separate sections, which were woven together into an evening length production, without interval, by artistic director Ruth Osborne, and with input from dramaturg Pip Buining. It was an ambitious undertaking. The focus of the evening was largely on contemporary environmental issues, a focus that comes easily to mind given the subtext of the poem (despite that it was written at the end of the eighteenth century). But in the end we saw several different approaches, especially in terms of how references back to the poem were made. Claudia Alessi’s work ‘My own private albatross’ made the most obvious statement about environmental issues, and perhaps, too, the most obvious reference to the poem when a voice-over clearly recited lines from the Coleridge work. Alessi’s section, which occupied the middle of the program, concerned the amount of plastic waste and other non-recyclable materials in the sea, and the effects that material is having on, for example, sea creatures. It grew out of the shock and concern Alessi felt at the amount of rubbish in the seas off Christmas Island, where she had recently spent time. The dancers used props frequently, including a long string of plastic bags and other detritus, which they dragged across the stage at various intervals. Choreographically, however, Alessi’s section was the least interesting of the three for me. I found the movement a little too simplistic and it seemed like an addition, rather than an intrinsic part of the section. Jack Ziesing’s ‘A hellish thing’ was the last section before Osborne’s finale. With its ongoing references to melting icebergs and black oil spills, it took quite a black view of today’s environmental issues. His work seemed the least concerned with the poem itself and more completely with a twenty-first century perspective. The oil spills, represented by lengths of black cloth, dominated right up to the end of Ziesing’s section. 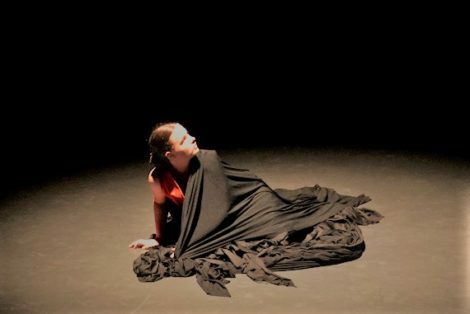 The dancers draped them around their bodies, sometimes covering themselves entirely, until at the end one dancer found herself alone shrouded in black, apparently sheltering under the very material that is degrading the environment. Ziesing’s choreography was quite powerful and the dancers had some strong group sections, which they performed with gusto. For me the standout section, however, was that choreographed by Eliza Sanders, which she had entitled ‘The poem is within us’. It followed immediately after Ruth Osborne’s introductory passage as the first section made by the commissioned choreographers. ‘The poem within us’ was subtle. It didn’t try to force us into anything, it didn’t try to be didactic, and it didn’t try to cover too many ideas within one short piece. The enduring image was that of an open mouth—’And every tongue through utter drought,/Was withered at the root’ says the poem. Was it a silent scream? Was it making the comment that the destruction of the environment is not being heard? So many thoughts surfaced. 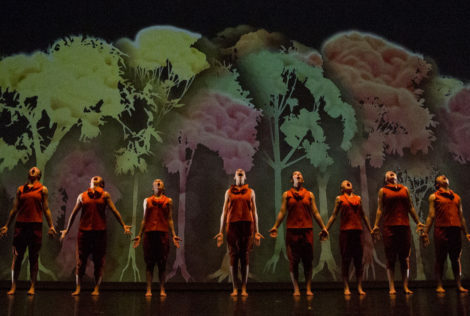 Choreographically, too, ‘The poem is within us’ wasn’t full of forceful movement, but focused on changing patterns and on building groupings of dancers. The one jarring element was the use of live speech. A few lines of the poem were quoted by one of the dancers, but this is a trap for the unwary I think. It is never easy to hear clearly from certain parts of the auditorium and the voice-over recording that Alessi used was by far the better way to go. But that element aside, Sanders takes an unusual approach to her work and I think she is a choreographer to watch. There was much to admire about This Poisoned Sea in terms of the collaborative elements. Mark Dyson’s lighting was often spectacular, and I especially liked the black and white floor pattern he conjured up at one stage. Cate Clelland’s costumes were also an excellent addition to the overall work. The pants worn by all the dancers were cut in a subtle way so that they made passing reference to costumes from centuries ago, while the addition of extra elements (the black belts in Ziesing’s work for example) distinguished each section from the others. This Poisoned Sea was an ambitious undertaking. But it remains in my mind as one of the best shows Quantum Leap has presented. The use of a dramaturg gave the work coherence, and the evening was well structured so that the work moved smoothly from the subtlety and beauty of Sanders, to the obvious from Alessi, to a strong contemporary comment from Ziesing. 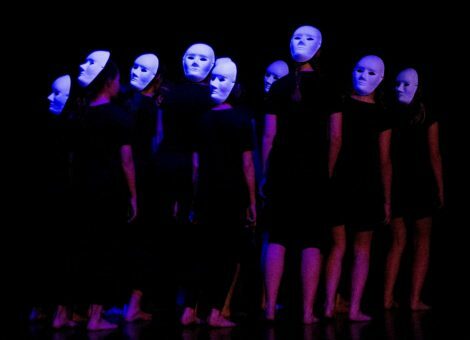 I recently spoke to several people associated with This Poisoned Sea, a forthcoming production to be performed in late July by Quantum Leap, the senior performing group of Canberra’s youth dance organisation, QL2. The story I subsequently wrote for The Canberra Times has yet to be published and, as often happens in these situations, I was unable to use everything I gleaned from those who were kind enough to talk to me. 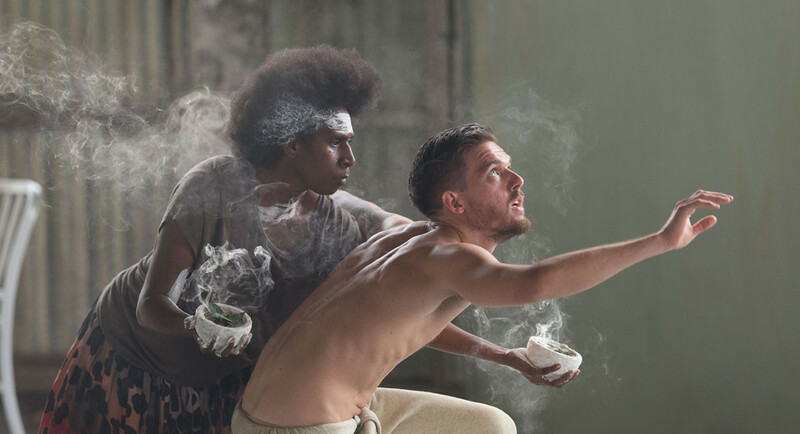 Independent dancer/choreographer, Jack Ziesing, is one of three choreographers engaged with this evening length work, which is inspired by Samuel Taylor Coleridge’s Rime of the Ancient Mariner. He spoke to me in some detail about the thoughts behind his section, which was made during a residency early in 2017. It has already been performed in Melbourne and Canberra as a stand alone piece. Looking at some of the production images from those performances I was struck by the the black cloth that seemed to be used throughout his work, and the images of black figures that were posted on the walls of the QL2 studio and that had been used as inspiration. ‘I responded to the figures in black,’ Ziesing remarked, ‘because the black looks like clothing but draped in the right way it could also look like a flag, a weapon, or oil. I liked the idea of a transformable substance that the dancers could use to clothe themselves, protect themselves, and build with. But all the while it’s the very substance that contributes to the degradation of their environment. They are trying to shelter themselves with the very material that hurts them. The other choreographers contributing to This Poisoned Sea are Caudia Alessi and Eliza Sanders. The full, three-section work will be performed at the Playhouse, Canberra Theatre Centre, 27–29 July 2017. 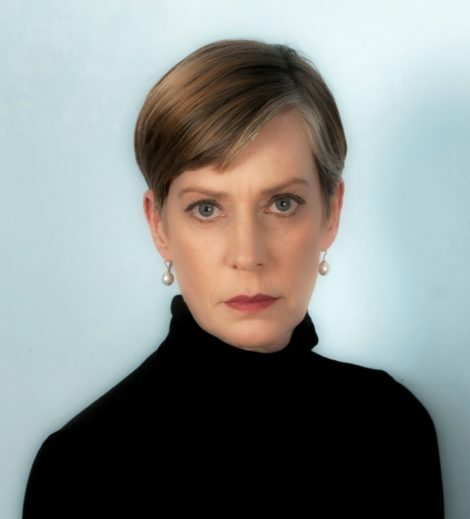 Early in June, Royal New Zealand Ballet announced the appointment of Patricia Barker as its incoming artistic director. She replaces Francesco Ventriglia, who ended his contract with the company in mid-June. Barker was a principal dancer with Pacific Northwest Ballet during the directorship of Kent Stowell and Francia Russell and, most recently, has been artistic director of Grand Rapids Ballet in Michigan. A review by Jennifer Shennan of Neil Ieremia’s As night falls for Black Grace makes interesting listening at this link. ‘A poetic ode to our troubled world’ is how Ieremia describes it, but listen to what Shennan has to say. 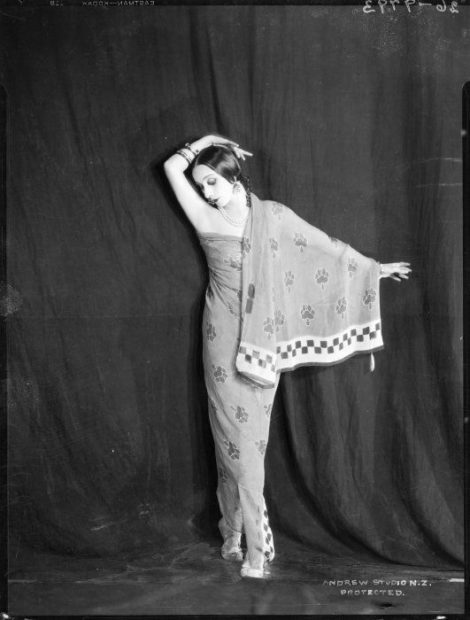 A comment from a New Zealand reader on my recent post about the Royal Ballet’s tour to Australia and New Zealand in 1958 sent me hunting for a photo of Anna Pavlova photographed in Wellington in 1926 by S. P. Andrew. The story goes, according to my correspondent, that Pavlova liked the photograph so much that she ordered 800 copies of it and paid in cash from a large black handbag! It is likely that the photograph below on the left is the one in question, although I rather like the one on the right as well, also taken in 1926 by S. P Andrew. 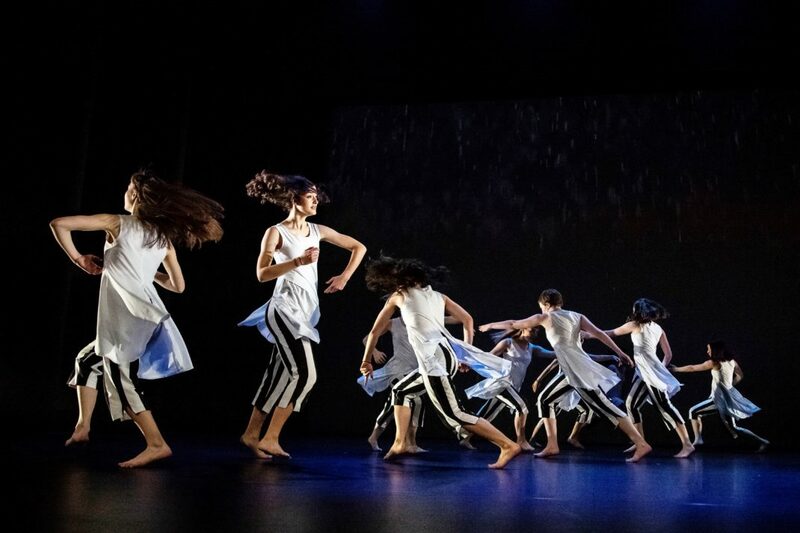 I was interested to hear that, as part of Refugee Week in the ACT, a dance-theatre work, based on the true story of a refugee from Afghanistan, whose name is Rohallah, was being produced for showing at the Courtyard Studio, Canberra Theatre Centre. I went along to see it. 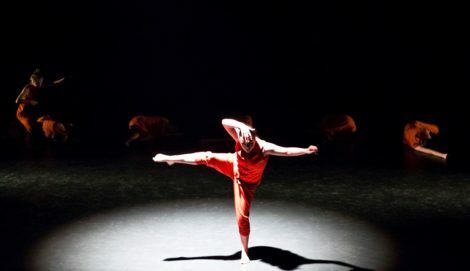 In my opinion, the work didn’t live up to expectations as a piece of professional dance and, given that Canberra’s several professional dance artists struggle hard to find sources of funding, I was taken aback to find that Rohallah had received support from the ACT government. It is not clear whether that support was financial or not, but apparently the ACT arts minister, Gordon Ramsay, was a first nighter. And indeed the ACT government logo appeared on the handout. I plead with the ACT arts minister to consider in greater depth what his department is supporting. We are grown-up, seasoned dance-watchers in Canberra. Please support work that treats audiences as such. May 2017 be a very happy and productive new year for all. 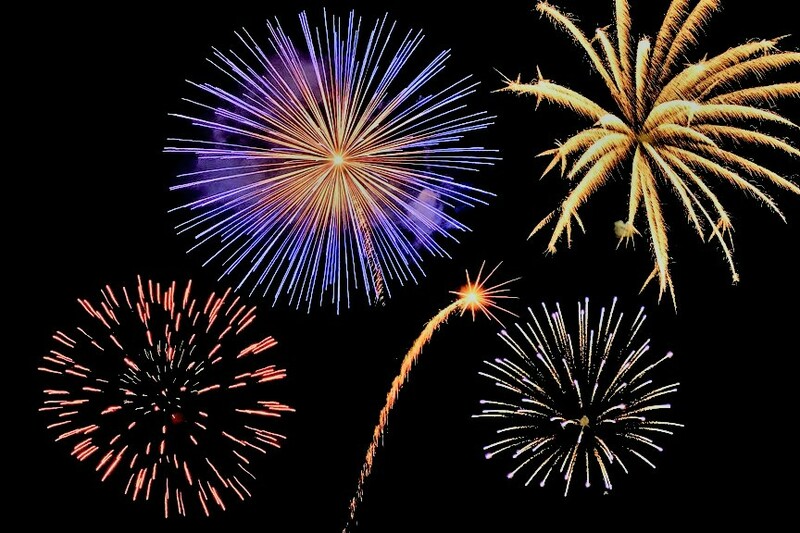 My thanks to all those who have logged on to my site during 2016, and special thanks to those who have made comments throughout the year, or made contact in other ways. My Canberra dance picks for 2016 have already been published by The Canberra Times, and posted, with additional comments, at this link. My ‘best of’ reaching beyond, but including Canberra will appear as part of the annual Critics’ Survey in Dance Australia in the February/March issue. Perhaps more than anything in 2016 I have been impressed and encouraged by Queensland Ballet—great programming, wonderful dancing, a company on the move. For me, QB’s production of Liam Scarlett’s A Midsummer Night’s Dream was the 2016 standout across the board. But the company also gave us the fabulously glamorous Strictly Gershwin; the mixed bill Lest We Forget, which included Natalie Weir’s haunting We who are left; and, of course, the warmth and comfort of an old favourite in the Ben Stevenson production of The Nutcracker. I look forward to more from this vibrant company in 2017. The On course program has become an annual December event for QL2 Dance. 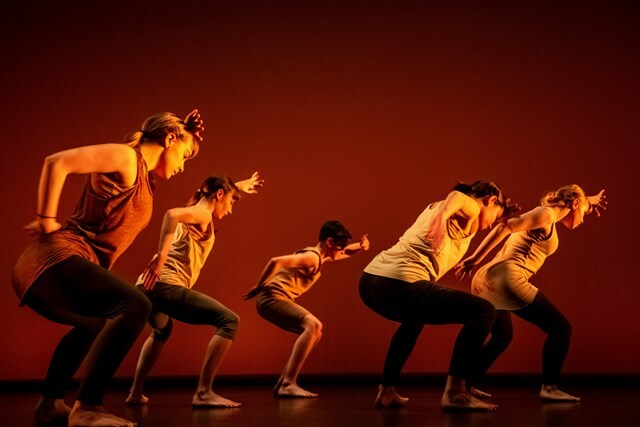 The program offers students taking tertiary dance courses from across Australia to come to Canberra to choreography, collaborate, perform and be mentored. This year, the tenth year of the initiative, nine short new works made up the program. It was an evening of occasional promise but overall a very mixed bag. Probably the most interesting part of the evening was a question that came from an audience member at the Q & A that followed the showing. A gentleman began his question with the words ‘I am a scientist.’ He then proceeded to ask (with apologies to the gentleman as I am not able to quote him exactly) whether the choreographers aimed to make work that was understandable, and whether they thought of the audience as they created. A long-ish reply ensued with several choreographers making comments, which largely focused on the fact that the choreographers thought more about giving expression to their ideas rather than whether it was understandable to the audience. 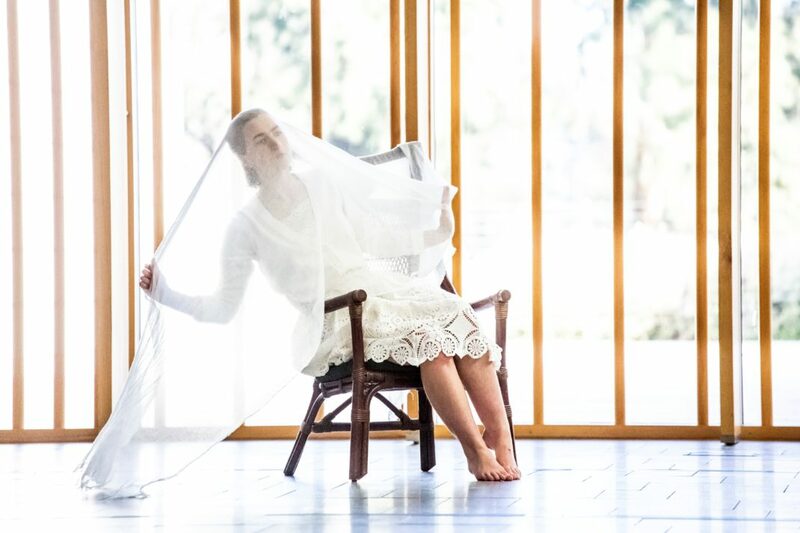 What surprised me most of all was that the initial, and perhaps most forceful response, came from Oonagh Slater, currently a tertiary student at the Victorian College of the Arts and a former performer with QL2. Her solo work was probably the most easily understood of any of the works, despite the title the body series: (corporeality) a progression and despite her comments about not making work with the audience in mind. It was strongly visual and could be easily read as an abstract work about shape, colour, form and space. The episode made me wonder whether young choreographers need better mentoring/teaching? And hats off to the scientist who (I assume) wanted to be able to understand what he was seeing. Why go to a performance otherwise?